Here are two projects using this bold new collection. This is a tag I made for my husband. He is a musician and has playing since he was in grade school. He also actually likes tags so I made him one that is just perfect for him. It even includes a little piece of him - the used guitar strings. He saves the strings when he puts new ones on and he rolls them on a coil. I just love using them on pieces for him. 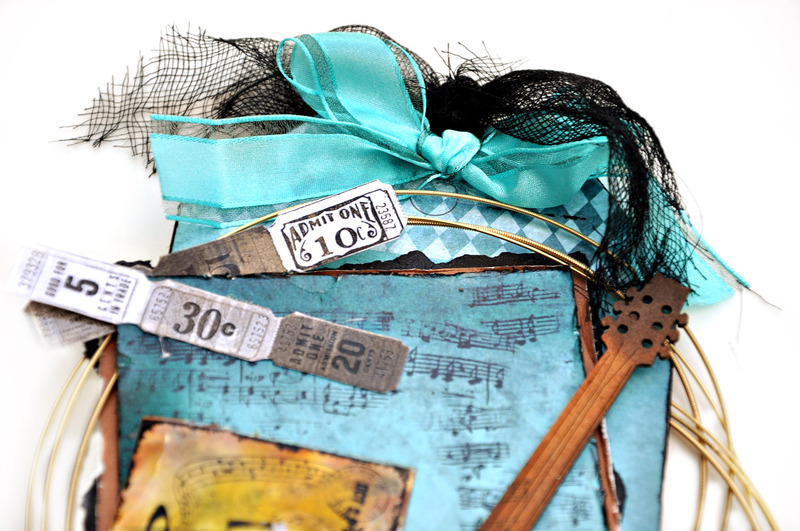 FabScraps has included some large chipboard tags in this collection. Wild At Heart Die cut chipboard Tags (7.75”x4”) DC59 007 They are absolutely the perfect size and have the great sturdy thickness of the chipboard so that you can include some heavier embellishments if you desire. Maybe even use for a cool Christmas ornament. The yellow sticker....that is also from this bold amazing collection. Wild At Heart Stickers – ST59 001. I adhere the stickers to white cardstock first because they are clear stickers and I find that the white cardstock backing really makes them pop. I also add a little to the back of the sticker. Now for the guitar chipboard piece Wild At Heart DC59 003, I tried really hard to make this piece look like my husband's guitar with some inking and then darkening around the edges. The tickets are FabScraps Wild At Heart Precut project die cuts – MC59 001A . They are also important here because he dreams of playing in a big venue to a sold out crowd. The tickets symbolize that sold out event. I used a Prima Music stamp for extra accent on the tag and to finish it off. Scroll down for instructions and supply list for this tag. 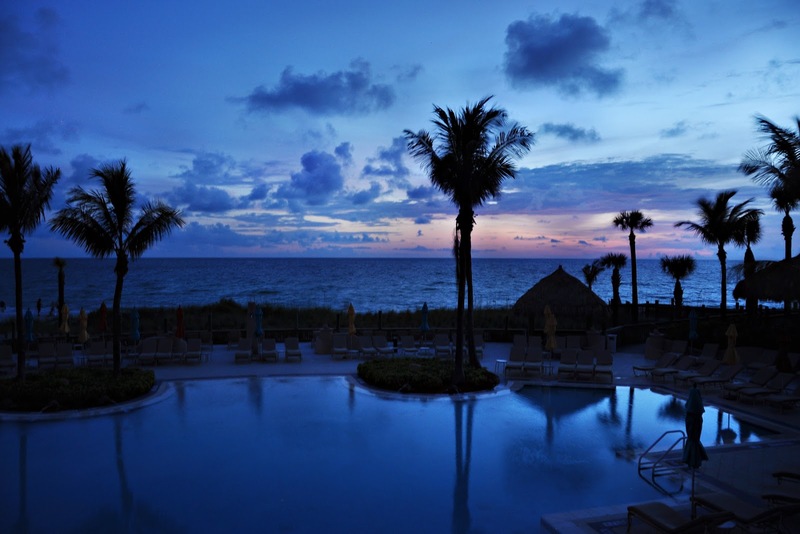 This is a photo I took at sunset in Sarasota Florida, June 2013. 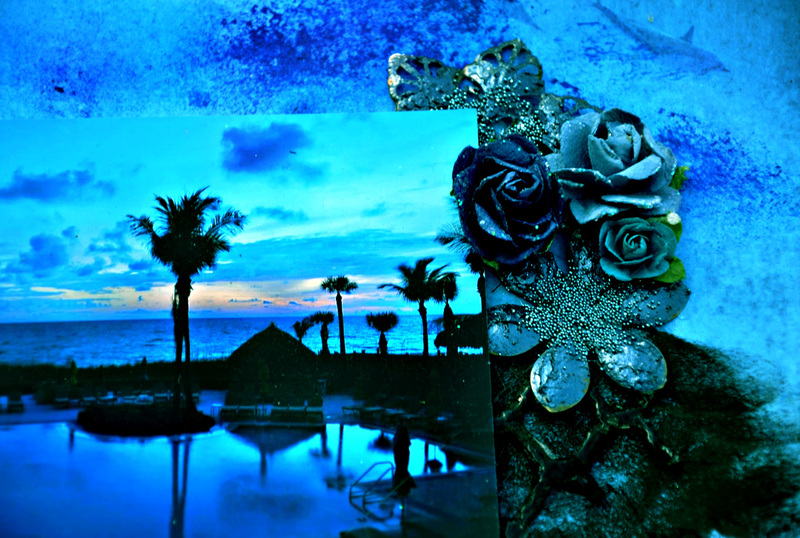 We were staying at a beautiful hotel on the beach with a pool overlooking the ocean. It was a wonderful evening and we were the only people enjoying the pool so I took advantage of the serenity and perfection. 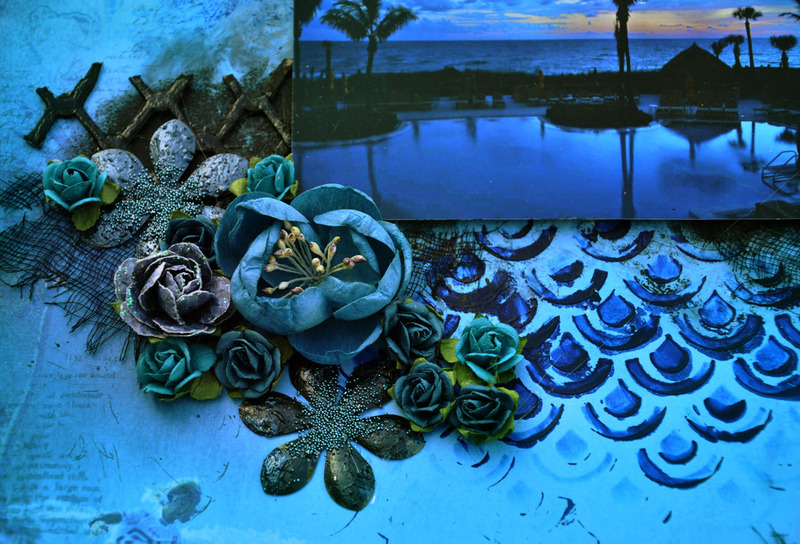 I decided to expand the landscape of the photo onto my page and make the serenity spill over onto my piece. I started with FabScraps Wild At Heart Surfing Wild 1 C59001 is the background piece. I painted gel medium on the page. The gel medium keeps paint and mist from soaking into the paper so that it is more workable and blends better – creating a flowing look. 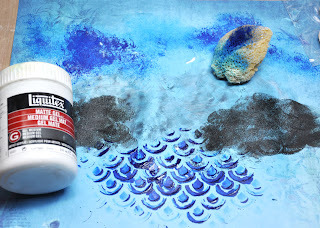 While the gel medium is wet, use a sea sponge to add some black acrylic paint or black gesso in the center of the page and extending out to the sides of the page. The sea sponge will make the black a little wispy and softer. I also added some stenciling with Prima Scales Mask 960438 to create water and used Claudine Hellmuth Semi Gloss paint Smidge of Blue for the water. I set my photo on the page for a look at my progress and a feel for what I need to add. Ahhhhhhh I need puffy clouds in the sky like in my perfect sunset. I got the sea sponge back out and added some gel medium to the sea sponge as well as some more Claudine Hellmuth Semi Gloss paint Smidge of Blue. Now I can embellish and complete! I painted the Wild At Heart chipboard Wire Border DC59 004 piece black and added glossy Shimmerz Dazzlers in Licorice Stick - this is a nice thick dimensional paint. I thought it would add some texture to the black landscape I painted. Then I started my floral clusters with some metal Adornments and Prima flowers : Serenity 5 Collection 571368. Here is my original photo. 2. Start with FabScraps Wild at Heart Collection –Die Cut Chipboard Tags DC59 007 sized 7.75”x4”. 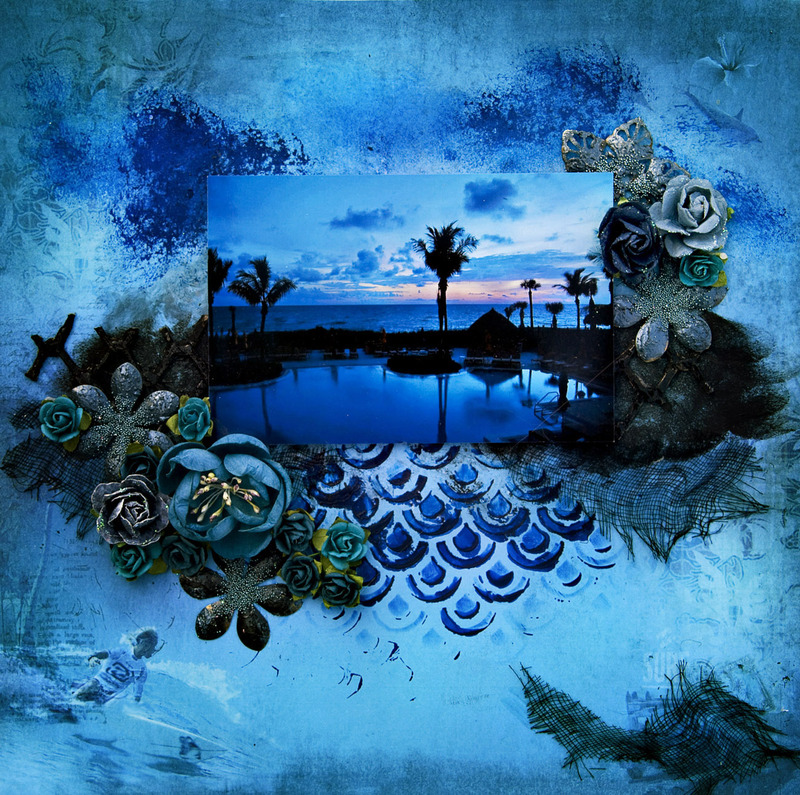 Cover with FabScraps Wild At Heart precut project die cuts – MC59 001A. The project die selected will match Wild Tunes1 paper C59 007. 3. Cut a piece of FabScraps Wild Tunes1 paper C59 007 to the size of 3’x5’. Distress the edges of your paper with the edge of your scissors. 4. Cut a piece of chocolate colored cardstock slightly bigger than 3”x5” so that the Wild at Heart -Wild Tunes 1 has a nice chocolate mat. 5. Rip a piece of black cardstock even bigger yet to be a mat layer under the chocolate cardstock. 6. Glue the layers together and then glue to the tag on a slight diagonal. 7. Stamp music notes on the top layer. 8. Wrap a small piece of black cheesecloth around the tag starting about halfway down the tag and tying on an angle. 10. 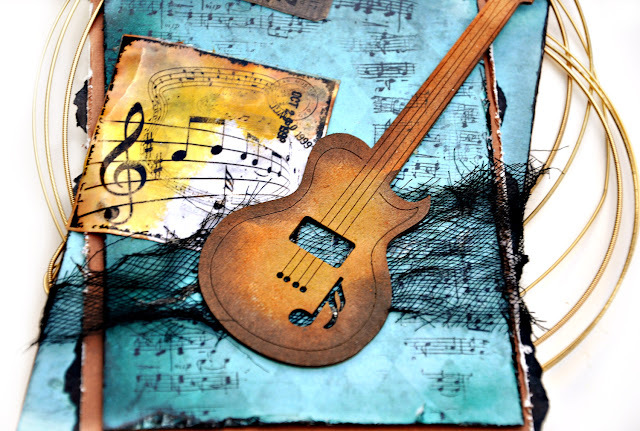 Using the Wild At Heart Guitar chipboard DC59 003, you are going to ink the guitar in a gradient fashion – lighter in the center and darker at the outside edges. Ink the inside of the guitar with yellow ink. The continue around the yellow ink with an orange ink. Finally ink the edges with brown ink. 11. Glue the guitar on the tag ( over the black cheesecloth). The neck of the guitar will point up and to the right. 13. Make some large circles out of wire and attach to the back of the tag. I used old guitar strings and wound them up. Glue a piece of cardboard over the back of the wire strings to keep them in place and be more durable. 14. Take the Wild At Heart ticket stickers ST59 001 and adhere to white cardstock. They show up much better on projects when adhered to cardstock first before using on a project. Tuck the ticket stickers to the top of the tag. 15. Take the Wild At Heart music stickers ST59 001 and gently ink the back of the sticker with yellow ink and then brown near the edges. Adhere to white cardstock. Tuck the music sticker slightly under the guitar. 16. Add some black cheesecloth and ribbon to the top of the tag. 2. 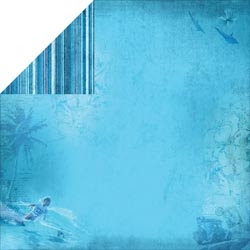 Start with FabScraps Wild At Heart Surfing Wild 1 C59001 paper as the background piece. 3. 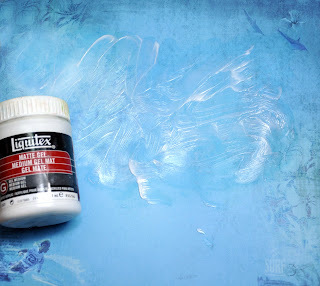 Paint gel medium in the center of the page and let dry. The gel medium keeps paint and mist from soaking into the paper so that it is more workable and blends better – creating a flowing look. DO NOT LET DRY. 4. While the gel medium is wet, use a sea sponge to add some black acrylic paint or black gesso in the center of the page and extending out to the sides of the page. 5. 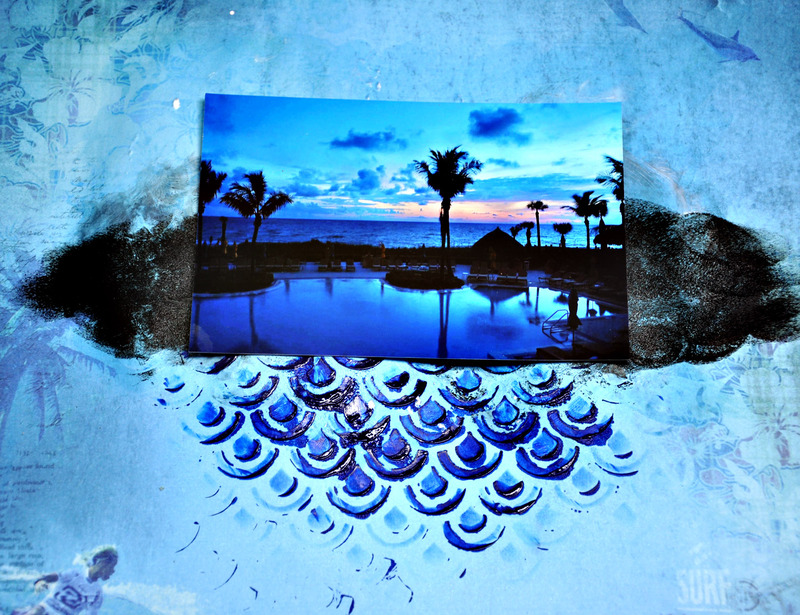 Use a mask and deep blue acrylic paint to create the illusion of water under the area where your photo will be placed. Let dry. 6. 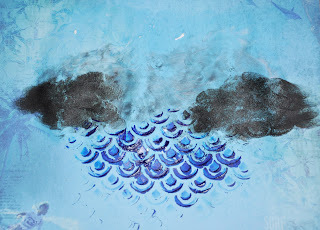 Time to create some wispy puffy clouds – add a little gel medium to the sea sponge and a few drops of blue paint. Dab onto the page lightly where the clouds should go. 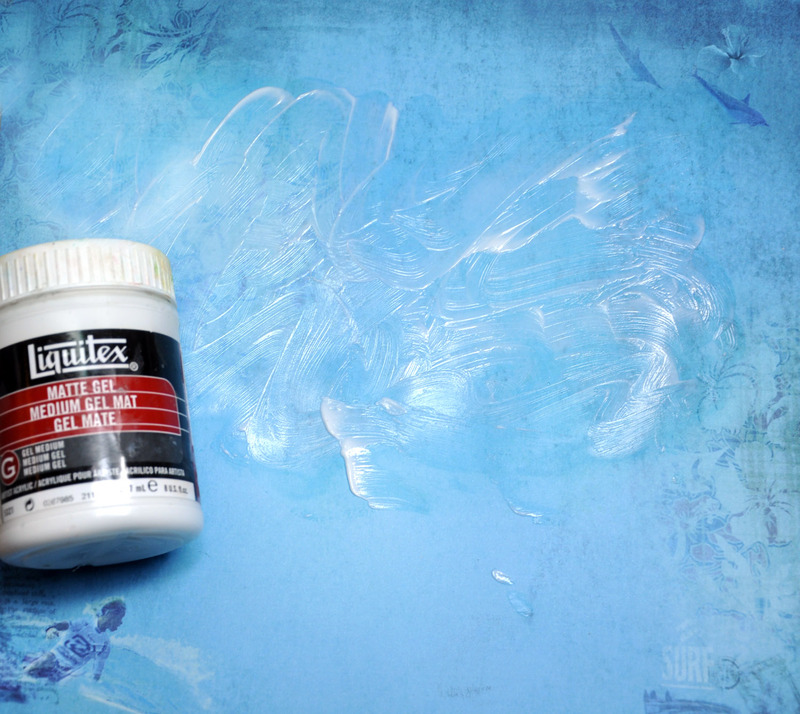 If too dark, add more gel medium to your sponge and dab on to page to thin out and lighten. Let dry. 7. Add a little black cheese cloth to both sides of the black painted background. Add a little piece of cheesecloth to the bottom of the page as well. 8. Back the photo with cardboard or dimensional tape and adhere to page above the water. 10. Cut two thin strips of Wild At Heart Wire Border chipboard DC59 001. 11. 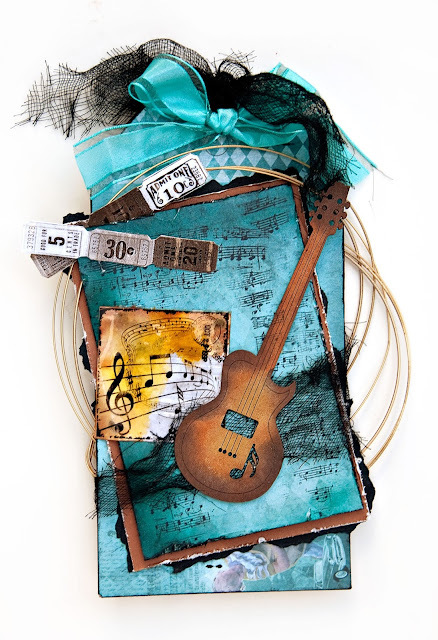 Paint the Wild At Heart Wire Border chipboard DC59 001 with black acrylic and top with black dimensional paint, to add extra texture to the chipboard piece. 12. Position each piece of the chipboard on the sides of the photo over the black painted background. .
14. Using metal flower shapes ( you can substitute with chipboard flowers or die cut flower)s , paint two flowers with black dimensional paint and two flowers with dark teal blue dimensional paint. While the paint is wet, pour some micro beads in the center of the flower. You can let air dry or dry with heat gun. Glue flowers to the page : two flowers on left bottom corner near photo and two on top right corner for the start of clusters. 15. Add additional flowers in the cluster.